The ideas you need to get your employee started on the right foot. Research suggests that onboarding may be the most critical time in an employee’s experience at a company. This early time period in their new role can make or break their future success at your organization. While it’s important to build a strong foundation from the start, it’s also important to keep it fun, showing off your company’s culture and personality at the same time. 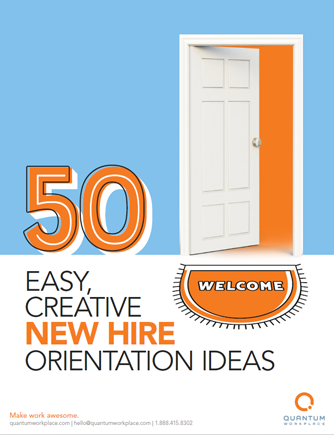 We’ve got 50 easy, creative new hire orientation ideas for you to try. Write your new hire a letter. Create a company jargon guide. Organize a new hire club. Set up 1-on-1s with leadership. Download this free copy to see more ideas to make your new hire feel welcome.